The Unbecoming of Mara Dyer was, without a doubt, one of THE most wanted books at BEA this year, and is one of this fall's most anticipated books! I read it before I left for New York last month, and I was stunned at how massive the hype for this book is! I did meet Michelle Hodkin though, and she was extremely nice and enthusiastic! Anyway, here is my review! Mara Dyer is falling apart. Still reeling from an accident months earlier and the resulting memory loss, She moves with her family from New England to Florida for a change of scenery. But Mara's memory loss, the death of her boyfriend and two best friends, lapses in memory, and strange hallucinations plague her continuously. She's certain she's not crazy, but that something is happening to her, and if she can figure out what happened the night her friends died, everything will be fixed. Frightened of getting close to anyone else, she pushes away the advances of Noah, a boy from school with his own secrets, but the more she pushes, the more Noah sticks around, until it's evident that whatever is happening to Mara isn't going away, and Noah might be able to somehow help her. The Unbecoming of Mara Dyer is a chilling book, and an absolutely fascinating look at one girl's struggle with post-traumatic stress disorder that just might be something more. The mystery behind what really happened the night of Mara's accident and what was so terrible that her memory has erased is fascinating, and Mara's lapses in her short term memory and the strange hallucinations that she has not only mess with Mara's head, but the reader's as well, and will keep them on the edge. The antagonism between Mara and Noah is an interesting development, yet it fits very well with Mara's current state of confusion, hurt, and her tough personality, and the barbs exchanged by the two flawed characters did provide some interesting tension. The novel does tend to be a little formulaic when it comes to some of Mara and Noah's early conversations and interactions at their school, which is stereotypically clique-ish to the extreme, but the driving mystery of what is happening to Mara and the strange occurrences that follow her everywhere make them easy to overlook. Hodkin certainly winds readers up throughput the novel, which is a surprisingly quick read, and then leaves them with many questions in the suspenseful conclusion that demands a sequel right away. 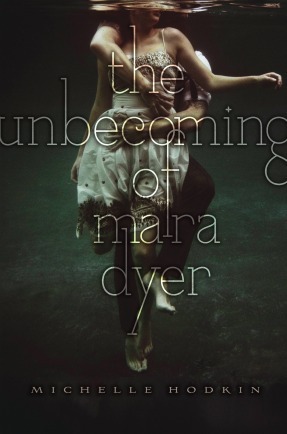 The Unbecoming of Mara Dyer is a fitting title to this fascinating and intriguing enigma of a book. Cover Comments: I think this cover is amazing! It really does fit the book perfectly. I did have to stare at the book sometime before I made out the there was a boy hugging the girl from behind, but once I saw it, I was even more intrigued. This cover is genius, and will sell books based on looks alone. The Unbecoming of Mara Dyer will be out on September 27th, 2011. Thanks for the review...I've been reading quite a few regarding this title and your's is one of my favorites. I'm one of those people who have fallen for the hype, lol, eagerly anticipating this book! I loved Noah Shaw! I can't wait to see how the story continues after that ending! Wowsa. This is so on my wishlist. I've heard just amazing things about it and can't wait to read it. Thanks for a great review! The Unbecoming of Mara Dyer is really a kind of chilling book.Which contains the story about the Mara's accident and as a result of it she Lost the memories.Great book it is. I can't wait to get my hands on this book! I'm always up for an unusual read! Thanks for the review! I like the "fix er up" element!